One of Philly’s newest bars promises a whole lot more than just some great-tasting brews! So what exactly does that mean? Thirsty Dice features everything you’d expect in a café: cocktails, coffee, craft beers and a creative food menu—along with more than 800 board games. Thirsty Dice’s mission is to give locals a place to kick back with friends, old and new, and enjoy food and drinks while engaging in great conversation and competition, a rare find among the often-crowded and noisy nightlife scene. The game selection is as diverse as the patrons. There are classics like Monopoly, Life, Guess Who?, Battleship, Trouble, Sorry and many others that will transport you back to childhood. Then there are party games that are a great fit for a group: Cards Against Humanity, Jenga, Trivial Pursuit and Apples to Apples. Strategy games are for those who really want a challenge, and there are also “light” games for newcomers and those looking to just pass a few minutes. Thirsty Dice intends to add more choices to its game selections frequently to give visitors a new experience each time they visit. While the games are among Thirsty Dice’s standout offerings, its food and drink menus are equally exciting. Snack bowls include popcorn (with an array of toppings!) and spicy or sweet mixes. The shareable menu features veggie options and unique offerings like “corn dog lollipops,” while comfort foods also abound, including French bread pizzas and an array of mac & cheese creations. On the drink side, gamers can hide out from the winter weather with custom-roasted Herman’s Coffee products or sip on flavored sodas, waters or milkshakes. Or they can opt to add a little spirit to their game with a creative cocktail (all named after classic board games), or choose from more than two-dozen craft beers and a good selection of wines. 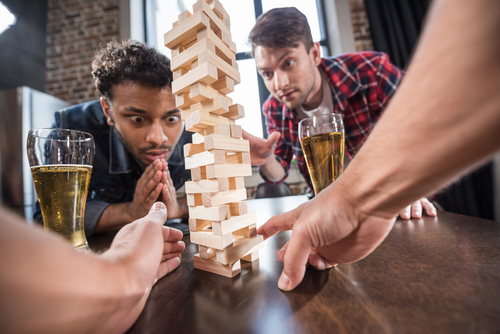 If you’re looking for an alternative to your usual bar scene, bring your game face to Thirsty Dice.